A counseling session back in April of last year was a turning point for me in many ways, and it gave me a new way of looking at a familiar Bible verse: Matthew 22:39. We've all heard it. It's the one where Jesus tells us that the second most important commandment is to love our neighbors as we love ourselves. The word we overlook far too often in that verse is "as." 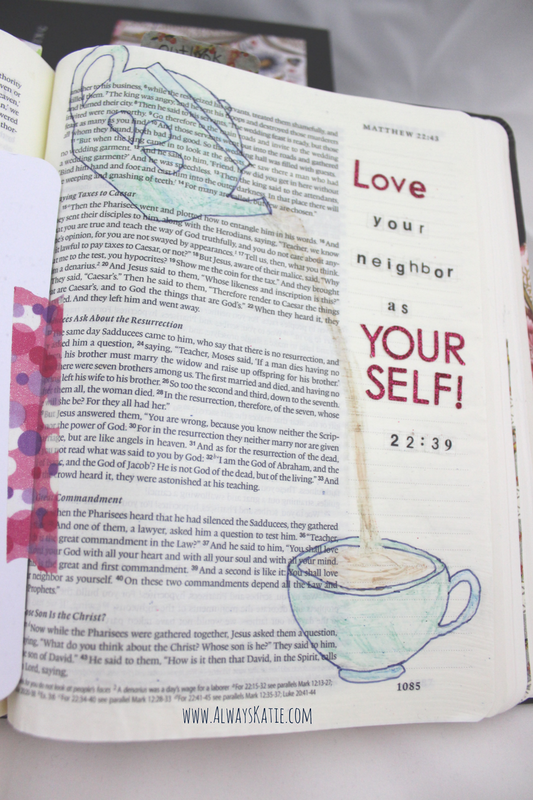 Love your neighbor AS you love yourself. To do this, you have to actually love yourself. I realized - and I'm sure I'm not alone in this - that I was expending enormous emotional and physical energy loving others, but not honestly loving myself. That's not His plan, and it's not His commandment. His commandment requires loving ourselves. You've probably heard or seen the admonition, "You can't pour from an empty cup." The illustration I painted in my Bible by Matthew 22:39 is of a teapot pouring into a cup. The cup is not tilted to pour out, though. As I told a sweet friend recently, it's not selfish to refill your cup just for you. It doesn't have to be with the sole purpose of pouring it back out. When you engage in self-care, try to occasionally do it just to simply care for yourself. Not to refill your cup to pour it out for your family, but because you deserve to not be running on empty! 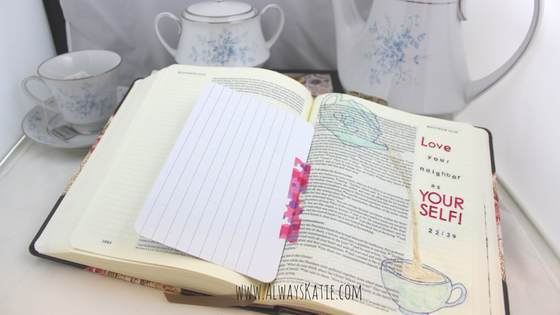 I prepped the page of my journaling Bible with matte ModPodge and let it dry thoroughly. It felt very plasticized. I sketched the teapot and cup and painted it all with watercolor. I'm very new to watercolor, but I kind of enjoy the unpredictability of the paint on the plasticized paper. I used letter scrapbooking stickers from Michael's, the glitter ones to emphasize "LOVE YOURSELF" in the verse. Then, and this is my favorite feature of this page, the little card that is taped in like a flap is a lined journaling card from Project Life and Stampin' Up! I taped it in with washi tape so that I could journal about my counseling session and the growth that came from it, while still being able to flip it out of the way and read the whole page. I also like taping sermon notes from my church bulletins like a flap, and then sketching whatever sermon illustration pops out at me. While I have no qualms about covering text with images, I do like being able to keep journaling on flaps and out of the way. Do you do any Bible Art Journaling? I have a really fun board on Pinterest, you should check it out! Have you ever made flaps like this? Have you been filling your own cup only with the purpose of pouring it back out? Doesn't it feel like you can just never catch up, like you're always drained? How are you going to commit to leaving a little something in your own cup? PS: You can sign up to be alerted when new Illustrated Faith products are released!